It was not always called the City of Lemon Grove. The land once belonged to the Kumeyaay. With the establishment of the Mission San Diego de Alcalá, it became mission land. With the fall of the missions, it became a Mexican rancho. Then gold was discovered in California, and the long march to community and cityhood began. 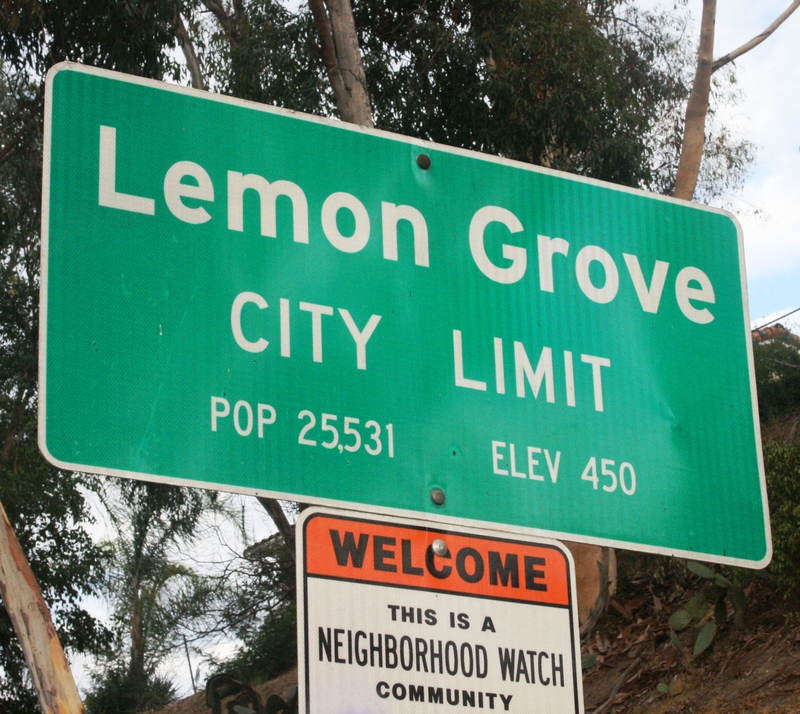 The City of Lemon Grove began as an idea. When the railroad arrived in 1888, developing orchards made economic sense. Joseph Allison, the son of Robert Allison, builds the first flume in 1891, bringing water to the land. A year later, he files a subdivision map for “Lemon Grove.” A packing house, a train station, a store and a post office quickly follow. By 1895 acres of citrus trees blanket the area. Residents of the area who were linked by common enterprise and the name associated with their post office, banded together to build a community. Early organizations include the Lemon Grove Fruit Growers Association and the Lemon Grove School District. The First Congregational Church was organized in 1894. The first church building – Atherton Chapel – was erected in 1897. Municipal services were non-existent. Government meant the County of San Diego. It was based miles away in Old Town or Horton’s Addition. The sheriff and courts were distant. Lemon Grove’s first constable was appointed in 1903. Its first court came in 1913, but lasted only a short time due to lack of business. The Good era saw the rise of community organizations. The “first annual Lemon Grove Products Exhibit” is organized by the Civic League. Lemon Grove’s second attempt at forming a Chamber of Commerce takes hold. The Forward Club (part of the Women’s Club movement) builds a large clubhouse that becomes the social center of the community. Fire service was handled by the forestry department, but there were only six telephones in town to call for help. There was no local fire service until 1925, when payment of $7.50 got you a fire hydrant in front of your house. Volunteer firemen were paid $2 per fire response. The stock market crash of 1929 spelled the end of the volunteer fire department. It would be 21 years before the residents of Lemon Grove would form another fire district. In 1928, Lemon Grove’s Main Street is paved. The post World War II era brings prosperity and change to Lemon Grove. Orchards were plowed under, and suburban development took their place. The United States Navy became a force in the natural harbor of San Diego, and many young sailors and Marines decided to put down roots and stay. To accommodate development, the City of San Diego began annexing nearby areas. Lemon Grove lost Encanto, and later College Grove. The County of San Diego controlled Lemon Grove land use decisions, but was often slow to respond to the area’s needs. This led to a series of incorporation attempts by the residents of Lemon Grove. The first attempt came in 1955. It failed. The second came in 1958. It lost by 513 votes. The third attempt in 1964 went down to defeat. By the 1970s, Lemon Grove’s pioneers were gone. The torch passed to the doctors, lawyers, businessmen, and community boosters of the post-war era. In April of 1975, the Citizens for the Incorporation of Lemon Grove was formed. Led by retired Navy Chief and local business owner Dell Lake, the committee represented a cross section of Lemon Grove. Their efforts were successful and in July of 1977, Lemon Grove became California’s 414th city. The City took over fire protection from the Lemon Grove Fire Protection District. It took over sanitation and street lighting from the County. But it lost more territory in the bargain. It ceded lands north of Highway 94 – land once home to the Waite family farm and the old stone quarry – to the City of La Mesa. In charge of its own destiny, the City of Lemon Grove recreated its historic train station. It moved city hall from temporary quarters to a remodeled Lemon Grove medical building. It established a redevelopment agency to attract new businesses, and to improve the appearance of its business district. It revitalized recreation facilities, and built a new Civic Center Park. Do you want to learn more about the history of the City of Lemon Grove? Check out the Lemon Grove Timeline. Visit the Lemon Grove Historical Society’s Parsonage Museum in Civic Center Park. Then become a member. Join us! Become a member of the Lemon Grove Historical Society to support historic preservation, and help us protect the irreplaceable!